Moving from traditional offices to an activity-based office made Hartela personnel improve their interaction and diversify their ways of working. A living-room-like lounge is now the heart of their operations and a perfect setting for spontaneous encounters. Gullsten-Inkinen took part in the spatial design and development of the entire property since the beginning of the project. All premises on one floor. A comfortable lounge in the middle of the premises. 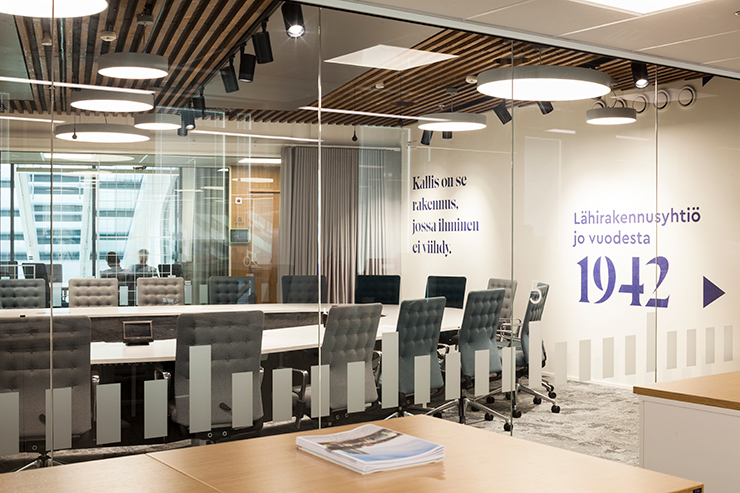 The spatial solution for the brand-new Hartela HQ has created a significant change in the company’s working culture. 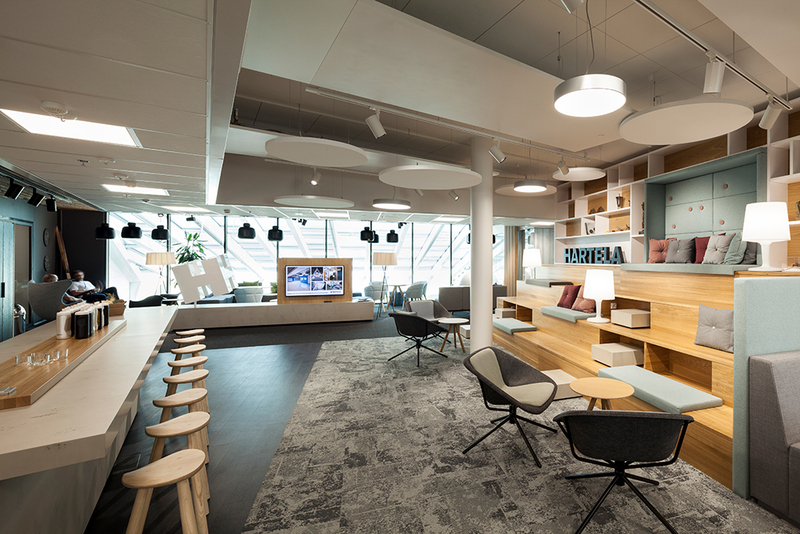 At the turn of the year, Hartela-yhtiöt Oy and Hartela Etelä-Suomi Oy moved in to the company’s property development in Ilmala, Helsinki. 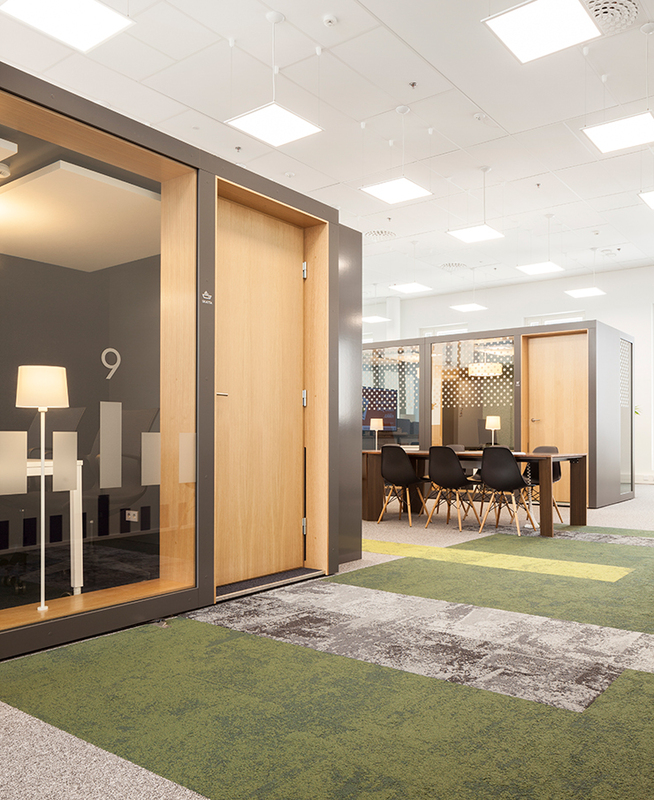 Transferring into a shared address allowed the Group to move on from traditional offices to an activity-based office. The company abandoned separate office rooms. All of the staff is now placed in an open office. Some have their own permanent desks while others use varying desks in a mobile area. In addition, the premises include project rooms and retreats, from which people can choose a space that best suit their current task. Another major change is that all 70 employees now work on one single floor instead of several separated sections. This is possible thanks to the exceptionally large floor area in the new property. The advantages of the change are obvious. The lounge by the entrance is the new heart of the offices. It’s a cafe and, most of all, a meeting place. There’s a constant buzz at the coffee machine. There’s an island with a buffet of fresh fruit and newspapers. A wide set of stairs provides an easy occasion to sit down and work or just exchange ideas. Soft acoustics. The floor-to-ceiling windows let natural light flood in and provide a generous view to the flow of traffic on busy Hakamäentie. The Ilmala train station is just beneath the building. 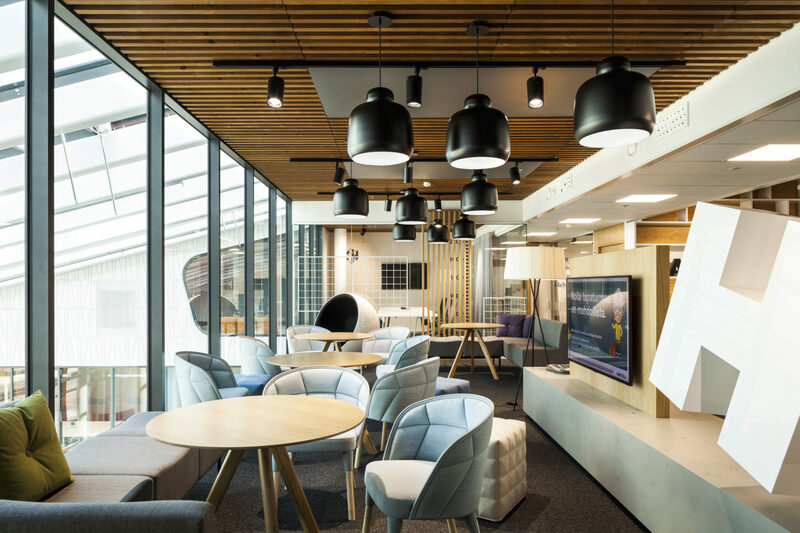 Anniina Saari says the lounge enables managing many tasks spontaneously and informally. Hartela started to develop the building a couple of years ago. The main operator was going to be the Helsinki Region Environmental Services Authority HSY. Hartela decided to place its own HQ in the property, too, to showcase its modern office building skills and expertise. Gullstén-Inkinen took part in the spatial design and development of the entire property since the beginning of the project. The encounters, or the lack of them, carry major strategic importance. “When people are able to face each other more, they learn to know each other better and are able to build trust. This’ll produce new ideas that can lead to commercially interesting endeavors,” Inkinen explains. Before the move, the Hartela people received a “user manual” of the new premises. It’s a comic book-type guideline material produced by the HR and communications departments titled “Welcome to Work Together”. “The guideline presents in a fun way the rules of the new offices and our desired work culture. Whether it needs to be quiet in an open office or if people are allowed to talk, to speak on the phone etc. After all, the premises just form a platform for operations. 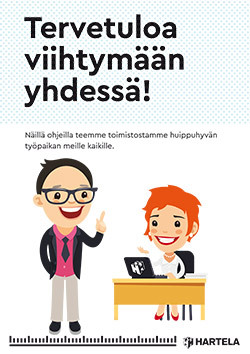 We must together set the rules on how to use the premises,” Anniina Saari points out. The new premises have been received very positively. Stylish, yet homey. Feels comfortable. I get a good feeling every day I walk into the office. How do I get to work here? In Saari’s view, the feedback given by the personnel and the visitors indicates that Hartela’s most important brand message has gotten across. Jari Inkinen thinks it’s wonderful that Hartela has brought home style to a new level. “Heikki Hartela’s brief to spatial design was simple: make the space feel like a second home. Although it’s a work place, it doesn’t have to be cold and corporate. That’s why there are proper windows, not a ribbon of glass. The milieu is small-scale and positively surprising – just like a home,” Inkinen explains. Human scale is visible throughout the property. The ground floor lobby is fairly small, leading straight to a restaurant that forms an urban meeting place in the fast developing Ilmala area. It’s a convenient location to arrive by bike through the central park or by foot. Bike maintenance and large change room facilities are located downstairs. Part of the new company culture is electric car sharing among the Hartela and HSY staff. But how far can spatial design reach to promote a work culture? What management does is essential. “There’s no use talking about activity-based offices if the executives keep their own large corner offices. In our place, the managers, including the CEO, all sit in the open office like everybody else – not to mention that they sit in the most mobile area,” Saari says. Gullstén-Inkinen designed the HSY and Cinia premises and the entrance and restaurant sections of the new Ilmala station building. Read more about HSY office opening.